Secondary Highway 654 is a local highway in the District of Parry Sound that serves several communities along the southern shores of Lake Nipissing near Callander. 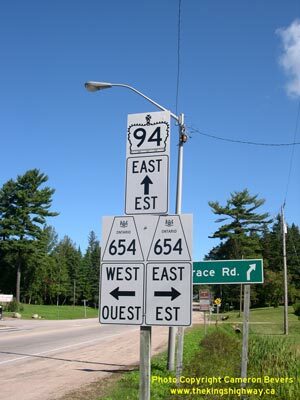 Highway 654 came into existence in 1964, when the Department of Highways of Ontario (DHO) assumed a new provincial highway southwest of Callander. Preliminary Assumption Plans were prepared by the DHO on July 27, 1964, which showed the proposed assumption of a 7.5 mile section of a new highway through Nipissing Township and a 6.5 mile section of new highway through North Himsworth Township. The section of Highway 654 lying within Nipissing Township was assumed on August 28, 1964, and was formally designated as Highway 654 by an Order-in-Council, effective September 24, 1964. The section of Highway 654 lying within North Himsworth Township was assumed on August 27, 1964, and was formally designated as Highway 654 by an Order-in-Council, effective October 8, 1964. The highway was already paved when the province took over the road. The route of Highway 654 was extended slightly in 1987, when a new interchange was constructed at Highway 654 and the new Highway 11 Callander Bypass. The route of Highway 654 has not changed substantially since that time. Unless posted otherwise, the speed limit on Highway 654 is 80 km/h (50 mph). Services are available at the Highway 94 Junction.